Thread: What is the name of this pattern? Super sleuths help me please. What is the name of this beautiful pattern? I have it drafted....easy peasy but certainly it has 1 or more names. Thank you. Last edited by Fraew; 07-01-2013 at 04:24 PM. Beautiful! Don't know the name though. Would be a good candidate for strip piecing. I don't know either - but that is a beautiful quilt! I don't know the name, but sure looks like a lot of work. Looks like a 64 patch with sashing and 9 patch setting squares. Are we all stumped by this beauty? 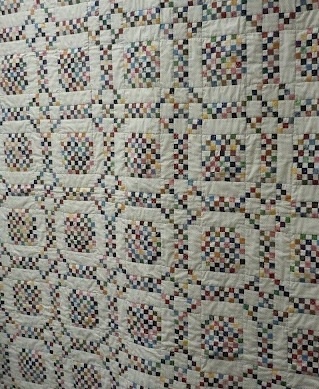 @GrannieAnnie: I searched as you suggested and found 1 quilt titled Irish Chain variation. Thanks. I'm still a searchin'. Your mystery pattern is a variation of the Burgoyne Surrounded quilt pattern. It is on my "things to do" list too. @Patrick's Mom: another search for Burgoyne Surrounded and I found "1" example. I guess you and I better get busy making ours to add to the variety. I think you could easily chain piece this: by make double 9-patches and 64 patches, and (9patces in the middle row) rail fence blocks. Hi, The above pattern is called Country Lanes by Kaye England. I have been collecting pink fabric to make this pattern someday. @ Fabric Hound: Thank you! 1 more hit. This search yielded multiple examples. It looks like a converted cross stitch pattern. Beautiful! How big are the small squares? I'm thinking 1" finished is more my speed. Lovely quilt, so many little blocks, now that would be a test for accuracy. Hope you find out the name. I do not know the name of the quilt, sorry; however, that's a lot of tiny squares to sew together, although it's beautiful. Mystery solved! I think this is the exact pattern/name that I was looking for. I would like to add that to my to do list. It is really nice. It's sure a beauty! but. it's sure a lot pieces! thanks for sharing! I have made a number of postage stamp quilts and really enjoy them. But this is an entirely new pattern to me. and I love it! Making it will take a lot of time and a lot of patience, but I think the end results would be amazing. Thank you for bringing this lovely quilt to our attention. I have already figured it out and am working on the middle block lol.